Volcanic boulders located on the foot of Mount Konocti next to Clear Lake. These small areas may not be worth a road trip but are fun if you are in the area or passing thru. The main area is called the Black Forest and, as of a 2007 land trust that preserves the north-east slope of Mount Konocti, they are now open space. Old growth Douglas Firs, wildlife habitat and a natural outdoor playground of about a dozen small mushroom shaped boulders with technical, powerful problems fairly close together with mostly flat, fir needle covered landings. The rock here is volcanic welded tuff with cool little pockets, edges, slopers and a few jugs. A few more boulders are nearby along with camping, boating, fishing, swimming, chilling, and sightseeing at Clear Lake State Park. About 5 boulder problems are found alongside the parks entrance and about 5 more are found in campsite 110. Don’t park in Campsite 110 unless you pay for camping in it. You have to park at the bottom of the hill in the main parking lot and hike up to it - and obviously don't boulder at the site if it is occupied. 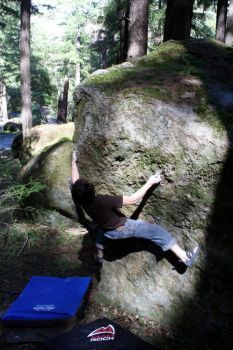 *The problems in the Black Forest often have fir needles piled on top of a lot of the holds - a quick brushing (or brooming) will take care of the needles on most of the problems for about a day or two and maybe up to as long as the whole season of bouldering sessions. Which SuperTopo guidebooks cover Clear Lake (Black Forest)?